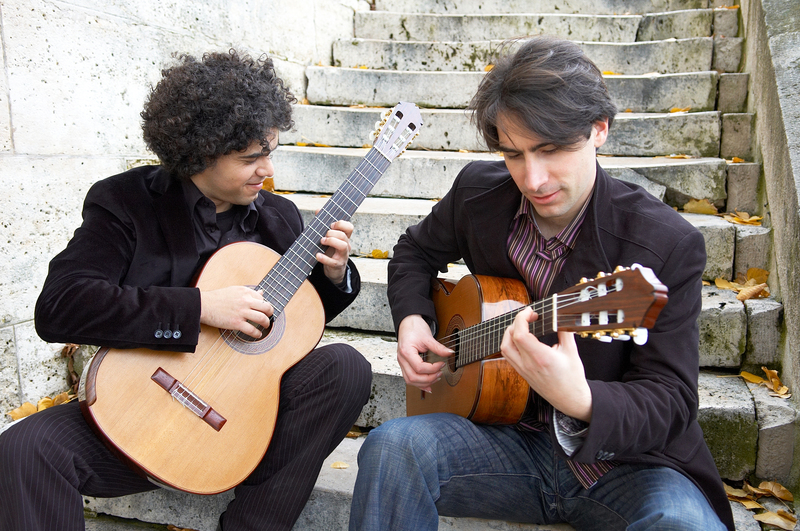 Sept. 23, 2009 -- French classical guitarists Jérémy Jouve, winner of the 21st annual Guitar Foundation of America competition, and Judicael Perroy, winner of the prestigious Guitar Foundation of America International Competition, will perform in concert as the Paris Guitar Duet in the third event of Arkansas State University’s Lecture-Concert Series. The duo will perform on Thursday, Oct. 1, at 7:30 p.m. in the Fine Arts Recital Hall of ASU’s Fine Arts Center, 114 S. Caraway Road, Jonesboro. This event, like all events in the Lecture-Concert Series, is free and open to the public. The ASU Guitar Guild is a co-sponsor of this event. Jérémy Jouve, who began his study of the guitar at age seven and began his concert career at age 11, has performed as a soloist in many countries including India, Poland, Greece, Hungary, Switzerland, Italy, Russia, Germany and France. Judicael Perroy, who also began his guitar studies at the age of seven, and was acknowledged a prodigy by age 11, graduated from the Paris National Conservatoire of Music, earning the highest placement in his class. In Oct. 1997, Perroy won the Guitar Foundation of America International Solo Competition in and has toured in France, Guadeloupe, Germany, Spain, Portugal, Denmark, Russia, Yugoslavia, Australia, the USA, and Canada. Jérémy Jouve has always been active in a diverse array of musical projects. Among his many abiding interests are jazz, Indian classical music, and contemporary music, which has found him concertizing on the electric guitar in various ensembles. A seasoned chamber musician, he regulary performs in several chamber music groups. For more information on Jérémy Jouve, visit http://www.jeremyjouve.com/. Judicael Perroy was awarded the "CA" in 1995, the highest teaching certificate that an individual must have in order to teach in a National Academy. Although Perroy usually teaches at the National Academy of Aulnay-sous-Bois near Paris, he stood in for Stephen Robinson, the guitar teacher at Stetson University in DeLand (Florida) for the first semester in 2000. Perroy has recorded Johann Sebastian Bach’s “Suite for Lute,” Isaac Albeniz’s “Sevilla,” “Cordoba,” and “Asturias,” Agustin Barrios’ “Le Catedral,” and works by Enrique Nuñez, Astor Piazzolla, and John Dowland, along with many others. For additional information on Judicael Perroy, visit http://www.judicaelperroy.com/. Listen and watch Jérémy Jouve and Judicael Perroy perform the first movement of Joaquin Rodrigo’s "Tonadilla" in a recording session for Naxos Records on YouTube (http://www.youtube.com/watch?v=xayvldqh7dQ). Visit the Paris Guitar Duet on MySpace (http://www.myspace.com/perroyjouveduet). The ASU Guitar Guild membership consists of ASU students and local community members and supporters. It is a student-run organization formed for the purpose of advancing the art of guitar performance and pedagogy, and it seeks to build a strong, supportive community of guitarists on the ASU campus and throughout the Northeast Arkansas region. To learn more about the ASU Guitar Guild, visit online at http://spio.astate.edu/guitarguild/. The ASU Guitar Guild is advised by Dr. Timothy Crist (tcrist@astate.edu).